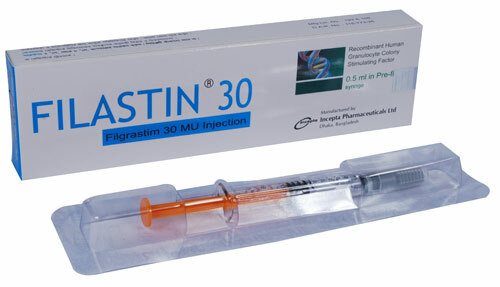 Filastin 30 pre-filled syringe injection: Each pre-filled syringe contains 0.5 ml sterile solution which contains Filgrastim (G-CSF) 300 microgram (30 MU) as Filgrastim concentrated solution EP. Filgrastim is a human granulocyte colony stimulating factor (G-CSF) produced by recombinant DNA technology. G-CSF regulates the production of neutrophils within the bone marrow and affects neutrophil progenitor proliferation, differentiation and enhances phagocytic activity. There are no adequate and well controlled trial on pregnant women, the effect of Filgrastim on the developing fetus and mother is unknown.